The Evoc Stage rucksack is newly designed and features the innovative carrying system that automatically adapts to the individual shoulder width of the wearer. Easily accessible compartments makes the Stage a must have rucksack for commuter use. The requirement here is to transfer even larger loads to the body’s centre of gravity such that they become neutral, while at the same time minimising the contact areas with the back and shoulders. Evoc solve this contradiction by means of a back component where all ventilation components such as large ventilation channels 01 and specially grooved and perforated EVA pads 02 behind mesh material have practically been moved to the inside. 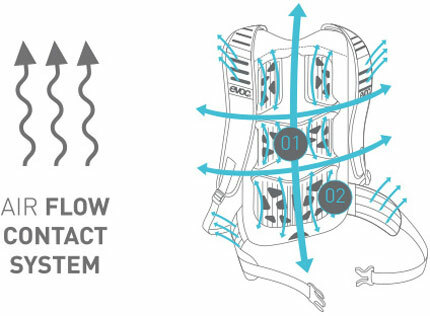 This ensures that the pack fits close to the back and simultaneously provides optimised back ventilation. Hip belt wings with air mesh and ventilation slots extend the concept of a close-fitting yet well ventilated back system in terms of load transfer and carrying area. The Brace Link is a freely moving connector that connects the rucksack shoulder strap and the pack in an innovative way, which enables the carrying straps to adapt to the individual shoulder width of the wearer. In addition, the Brace Link allows freedom of movement when riding a bike as well as for wearing a neck brace.